Editor’s note: CALIFORNIAN ELISABETH BRENTANO is racking up the followers on Instagram, and for good reason. In this piece she shares her insight into some of her most liked shots. You can follow her on Instagram here. I’ve been dying to see the lone tree at Lake Wanaka in New Zealand for quite some time now. Even though I had to wake up at 3:30am, I was thrilled to venture out to this beautiful and serene spot this morning. The cherry on top was watching a mama duck and her four little ducklings scramble out from under the tree and hop, one by one, into the water just before the sun peaked over the mountains. The truth behind this photo is ugly, but worth telling. I arrived at Lake Wanaka in New Zealand to shoot the famous lone tree at sunrise this past January. I wasn’t the first person there, but I was setting up at the same time as nearly two dozen other photographers. After a few minutes, I was confronted by a very aggressive woman who screamed at me to move out of her shot. I wasn’t anywhere near her frame. When I refused to budge, she continued yelling and proceeded to pick up my tripod and slam it down a few feet away from me. I did my best not to lose my temper, but I definitely yelled at her for touching my gear. I pointed out this was not “her” shot, but she tried to pull the same stunt with another individual, so clearly something was lost in translation. She didn’t bother me again, but I was pretty rattled by the experience. I hope telling this story will remind others that we sometimes need to be a little bit more respectful, and that most trees and lakes are here for everyone to admire — and share. I linked up with a photographer friend in the eastern Sierras last December, and though he advised against it, I wanted to meet at Convict Lake for sunrise. I realized I made the wrong call as soon as I pulled up to the parking lot. A massive storm was about to hit, and it was so windy I had to brace myself against a tree. Neither of us got any decent shots, so we laughed it off and headed south to a calmer spot along the Owens River. Just as the clouds were starting to blanket the mountains, we caught the last bit of morning light on the landscape. Two minutes after this photo was taken, the wind picked back up and knocked my friend’s tripod over, so we called it a day. Hot coffee and pastries seemed like the logical next step, and as we munched away on breakfast, snow gently started falling outside. Perfection and chaos, all in the span of three hours. This photo was taken on my first trip to Death Valley National Park in April 2015. I’ve fallen so madly in love with this place, I’ve been back five times since then. I made my way across the Mesquite Flat sand dunes just after 6am, and I didn’t see another soul out there. The earth was still cool under my bare feet, but the air was starting to warm up, so it was a pretty blissful sensation. I accidentally left my camera’s ISO cranked up from an astrophotography session the previous night, and when I reviewed my photos later in the day, I wanted to kick myself. The light was incredible, but I was disappointed with the quality of just about every image I shot. I was still able to salvage a few, this being one of them. Funny, because I figured the morning would be a total waste, but this ended up being one of my 10 most liked shots ever. Getting ready for some wild winter adventures with @goldiehawn_ and @christianannschaffer in @YosemiteNPS today…not sure what we are getting into but there is quite a bit of snow on the forecast for the next few days! I was supposed to spend this weekend in Big Sur, but that plan fell through and I made a last-minute decision to head to Yosemite National Park with my good friend Christian. The first winter storm of the season left a dusting of snow on the valley floor, and we were lucky enough to catch it before it melted. After spending the morning of my birthday taking in this scene at Valley View, we wandered to a nearby field, which was covered in hoarfrost. Every branch and blade of grass sparkled like diamonds, and we explored this winter wonderland for several hours. On the first day of 2016 I hopped aboard a helicopter on the south island of New Zealand, and after flying over Doubtful Sound, we landed and checked out a secluded valley. It was then that I was introduced to the sandfly. These tiny insects seem innocuous enough, but don’t be fooled: They’ll leave you with some of the nastiest bites ever. My ankles were covered in itchy red bumps for weeks, so was this view worth it? 100% yes! 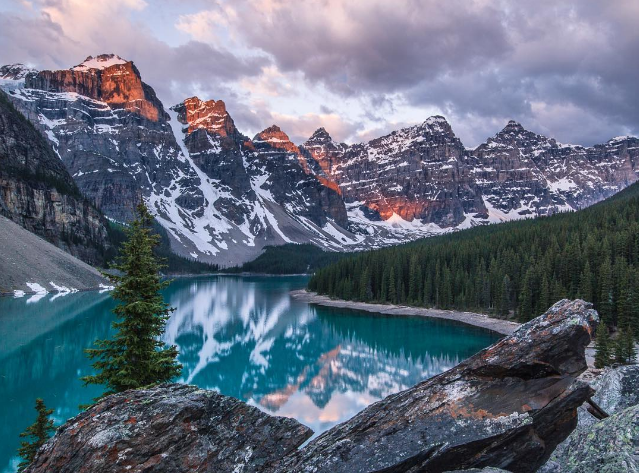 This may look like it was taken from some intense backcountry trip high in the Canadian Rockies, but it’s actually a view just a few minutes from the Lake Moraine parking lot in Banff National Park. It’s the same exact shot everyone else gets, but there’s a damn good reason why this vista is so popular. I was with two photographer friends last summer in Alberta, and we got up at 3am to shoot sunrise here. No coffee, no food and the possibility of bears had me in a pretty bad mood, but after seeing the alpenglow reflecting on the crystal-clear water, all was well. This shot was taken in the middle of winter in a waterfall canyon in Alberta, and while I was with a very experienced local, I would never attempt this on my own. We went early in the morning, wore crampons and constantly checked where we were stepping before we set up to shoot. Even with these safety precautions, I was worried. The water was moving rapidly under the ice, and there were just as many cracks as there were footprints. The previous day my partner slipped and fell during another icy canyon trek, and we had to stop by the hospital to get her face stitched up. I can’t remember the last time I was this scared, but the gorgeous scenery definitely helped ease my nerves. Well, mostly. After an uneventful sunrise at Glacier Point in Yosemite National Park last October, I was ready for a breakfast burrito and an edit session with my friend Adam. I had been on the hunt for fall foliage, but I wasn’t finding as much orange and yellow as I had hoped. However, when I saw these sunbeams exploding around some trees by the road, I stopped my car and immediately started snapping away. I’ll happily go hours without breakfast and coffee when the light is this spectacular. Rangers had set a number of controlled burns the previous week, and smoke was still lingering around the valley. You could smell it in the air, but seeing the rays bounce off it made it come alive in a way I can’t even describe. As I drove around Glacier National Park one afternoon last August, I noticed the clouds were starting to mix with the smoke from nearby wildfires, creating an eerie mood in the valley. Realizing this could make for a stunning photo, I parked at a deserted pullout, climbed down a 20-foot embankment and walked to the shore of Lake McDonald. I started shooting away near a patch of multicolored rocks, without even thinking about the fact that I was alone in bear country … with no bear spray. 15 long exposures later, I heard something crash through the trees behind me. Then it slowed down, and I could tell it was getting closer. When I could finally see that something large, furry and brown was moving through the woods 30 feet behind me, I went into complete panic mode. Could I outswim a grizzly bear? Would anyone hear me scream? Just as I was about to start yelling to absolutely no one, I realized it was a massive elk and it wasn’t headed anywhere near me. I laughed — and then I ran straight back to my car. I was so spooked for the rest of the day, I only stopped at turnouts where I saw other vehicles parked. Not only was it great to meet some new faces at the Instameet yesterday in @YosemiteNPS, but I loved seeing some old friends too. In other news, @goldiehawn_ and I couldn't believe our eyes when we stepped outside of our tent cabin this morning…I've never seen that much snow in the valley before! We had to leave just after sunrise to make it to the airport on time, and not being able to stick around and snap pics on the way out seemed like a crime. Lesson learned: Never book a return flight after visiting Yosemite…always drive up and give yourself and extra couple of days to explore! I spend a lot of time in Yosemite. Back in January I cruised around the valley desperately searching for a good sunset spot, but everywhere I looked, the horizon was completely grey. I missed sunset the previous night, so I was starting to get a bit frustrated. The fog was so thick, most of the major waterfalls were covered, and driving was becoming a bit of a challenge as well. Just when I was getting ready to give up, El Capitan poked through the clouds and put on a show far better than any fiery sky.